DESCRIPTION: Charming and sunny cottage sitting along the Bass Harbor shore with views of the working harbor. 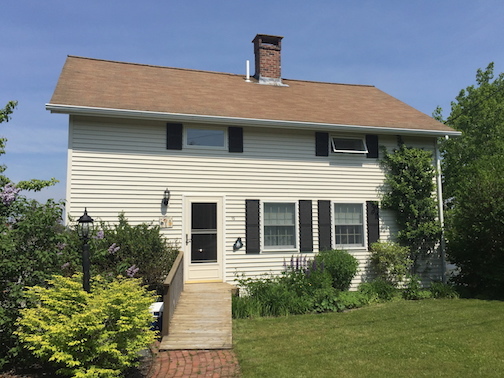 This cottage is fully equipped for all you may need for your Maine vacation. 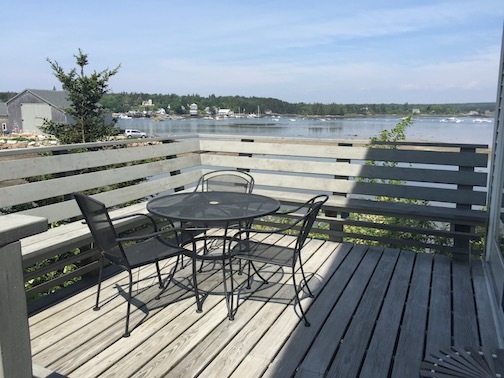 Enjoy your morning coffee on the deck overlooking the harbor or relax after a day of sightseeing throughout Acadia National Park. From the water's edge one can launch a kayak. Seaside Rose is conveniently located to the Swans Island Ferry terminal, the infamous Bass Harbor Head Lighthouse and Ship's Harbor and Wonderland hiking trails. Southwest Harbor is just a short 7 minute car ride for some shopping and dining. Also for convenience, grab a ride on the free Island Explorer right from the front of the house! LAYOUT: FIRST LEVEL: Fully equipped kitchen. Open dining area / living room with sliders to the deck and many, many windows to take in the spectacular harbor views. Full bath. Bedroom with a queen bed. SECOND LEVEL: Large and spacious open concept room with 2 designated sleeping areas both with queen beds. There is a sitting area set between and a 3/4 bath with shower (no tub). **Note this room does not have any doors separating the sleeping areas and the sitting area although they are each private in their own way as they are tucked into their own nooks - see photos. OTHER: Iron, ironing board, lobster pot, bicycle storage in basement. SPECIAL CONDITIONS: Please lock the doors at all times when not in residence.